Diagnosed with Stage IV thyroid cancer at 13, Hazel was prepared to die until, at 14, a medical miracle shrunk the tumors in her lungs… for now. I think I may literally be one of the last people on planet Earth to read A Fault In Our Stars. I’m going to keep this review fairly short because there is nothing I could say that hasn’t already been said. The characters in this book felt so real it’s insane. The dialogue between Hazel & Augustus is pretty much what made the whole book for me. I felt like the two of them spoke their own language, it was strange, quirky, philosophical, and almost always guaranteed to make you laugh. After I finished the book, the first thing I did was Google whether or not An Imperial Affliction was a real book. Deep down I knew the answer was no, but I was trying to sustain my disbelief because I really, really wanted it to be real. 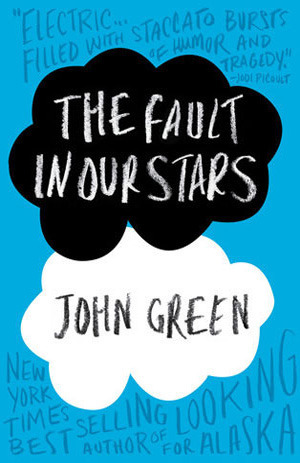 I wanted to read this spectacular book that meant so much to both Hazel & Augustus. I wanted to connect with them even more through this book they both loved. My one eensy, weensy, microscopic complaint was that some of the chapters were gargantuously long. The only reason this bothered me is because I’m one of those people who doesn’t like to stop reading in the middle of a chapter. So on nights I only had time for a little reading before bed it always turned into a lot of reading because some of the chapters took like half an hour. In conclusion, while I am happy I finally read this book and enjoyed it very much, I just didn’t fall head over heals in love with it like most people seemed to. Did I really enjoy it? YES. Do I want to read it over and over and name it my favorite book of 2013? No. This entry was posted in 4 Hearts, Contemporary, Review, Young Adult and tagged Dutton Books, John Green, The Fault In Our Stars. Bookmark the permalink. I wouldn't say it's a favorite of mine either but I absolutely loved it. Hazel and Augustus made the whole book for me too. The way they spoke to each other is very much like the author who I adore. I just wish I could bottle their wit and banter. I have yet to read a book by John Green but I always read about how amazing his books are. Glad you liked it. I want to try one because of all the great things people say about them but because of that same reason I am hesitant to try it. No worries about being late to the game – the important thing is that you got there eventually. 🙂 I agree that the dialogue was so unrealistic for two teens, but it didn't even matter because it was so great and touching and hilarious. And, like you, I have yet to find a John Green book that I love, although I did think this was good. I think John Green should actually write An Imperial Affliction, we'd all read it! How cool would that be?!? Glad to hear I wasn't the last, hehe =) When you finally get to it this summer I hope you enjoy it!! I read this book a few months ago, and I had similar thoughts. I really liked it, but it wasn't a favorite and while it was emotional, it didn't quite have the SAME emotional connection I have with all my 5 star reads. Looking for Alaska is the only other John Green book I've read, and THAT one is a 5 star read for sure. You're not the last! 🙂 I haven't read this one either, or any John Green books for that matter! This one sounds really good though and the characters feeling so real is something that would draw me to this. Great review! I have a BIG huge crush on John Green. I have loved all his books I've read so far. Now I might possibly be the only person left on earth who hasn't read this book yet… And I want to. I've never read any of John Green's books before, but I've always thought he was super funny and smart. Thanks for saying that while you enjoyed it it wasn't quite your favorite book in the whole wide world ever. Too many people act like this book is god's gift. I'm not saying it isn't, maybe it is, but it's setting up impossibly high expectations and I don't want the hype to ruin this books for me, you know? Anyway, thanks for the honest review! Lol, I also googled An Imperial Affliction….don't worry, I only read the book about 2 weeks before you! I balled like a baby( it doesn't help that I'm always an emotional wreck in books or movies). This was my first John Green books, but I am so excited now to check out his other novels! I agree, the dialogue is some of the best I've read too! I was afraid this would happen because everyone's hyped it up so much. It was really great but not a 5 star for me either. I'll have to add Looking for Alaska to my TBR! Phew, glad I'm not the last =) Haha! The characters were amazing, I hope you enjoy this one when you do get around to it! I haven't read any of his other books yet, but I want to! I agree, people act like it's the best book on the planet. It was good but I think all the hype had me expecting more! I cry so easily it's ridiculous yet I seem to love sad movies and books. It's a vicious circle, hahah! I'm excited to read more of John's work as well. Obviously I had heard of him before, but I feel like this book just totally exploded all over the place. It's now impossible not to know who he is. I totally understand your hesitation!